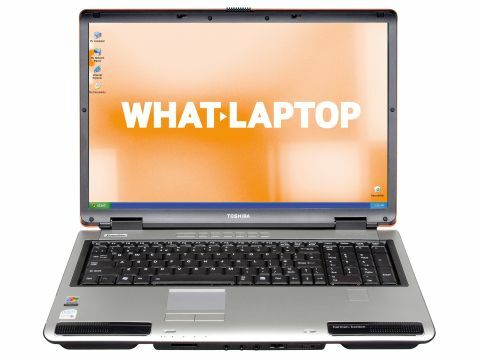 The Toshiba Satellite P100-429 is an affordable desktop replacement. With a 17-inch screen and strong performance, this is an impressive home media centre. Weighing 3.4kg, this is a system designed almost solely for the home. However, its battery life of 160 minutes is surprising, and means the laptop can be used on short journeys. The real benefit of such a large chassis size is its large 17-inch screen. With a glossy Super-TFT coating, colour and brightness are excellent, although screen reflections are increased. With a 1440 x 900-pixel resolution, there is plenty of room for working simultaneously with multiple windows. An equally large keyboard improves usability. A full number-pad is in place for data input, but means some keys on the main board are cramped and awkward to access. Strangely, the square touchpad doesn't match the Toshiba's widescreen panel, which is a minor design flaw. Increasing multimedia use, quick-launch media keys sit below the screen and allow control over music and videos. Audio performance is also improved over other laptops in this pricerange, with dedicated Harman Kardon stereo speakers at the front of the chassis. With Windows XP Media Center Edition preinstalled, your songs, videos and photos can be catalogued and accessed via a single user-friendly interface. A remote control is unfortunately not included. Using an Intel Core 2 Duo processor, impressive performance is provided. All software runs quickly, even when multi-tasking. With a dedicated Nvidia graphics card, 3D performance is high. Ability can't match the best gaming systems, but there's plenty of power for running even the latest 3D games, albeit at slightly reduced resolutions. Helping new users get started, a range of market-leading software is installed for basic home office tasks, as well as for watching DVDs and protecting your laptop while on the internet. Quick-start software from Toshiba is also included, again helping first-time buyers. With impressive power and multimedia usability, the price of the Toshiba Satellite Pro P100-429 makes it even more appealing. Mobility is limited, but for an affordable family media centre, there are few better options at this price.